You venture through the seemingly endless rows of Tents and Booths in the Trading District of Pokefarm, beyond Staff Building. After searching through the aisles, time pasts and a shine catches your eye. Looking toward the source of the light, you spot a Melanistic Pikachu sitting at a table in front of a large black and grey tint, decored with a Pikachu on top. A Monitor floats next to the Rodent Pokemon, catching the sun off its screen. 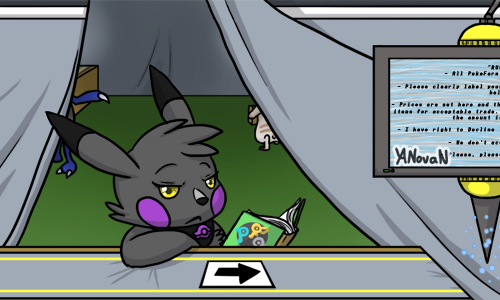 You approach the Tent, noticing the Pikachu is occupied by the book she's reading. Unsure to interrupt her, You look around at the table separating the both of you before spotting a note card with an Arrow on it, pointing to the Monitor. Taking a moment, you start reading through the writing displayed on the floating screen. The prices in every section are labled as clearly as possible by the shop owner. Most of the Prices in all booth areas have it listed as Swapping, Selling and/or Buying. Price boxes usually hold the prices of items, what can be swapped and possibly what Item is being sought after, etc. Swapping: Self explanatory Selling: Items listed are what The Shop is Selling them for. The price for said items to be sold. Buying: Items listed are what Novie would like to buy them for from other users. By the time you finish reading, you turn back to the Pikachu, startled with her now staring at you. How long has she been watching you!? Her golden eyes shine as she gives you a small smile, though her expression still seemingly not interested. "Hello. Welcome to Novie's Topsie Tent of Trades. My name is Yami, and I tend to this Tent of her's," She says politely with a soft tone in her voice, standing from her cushion. " If there's anything that peeks your interests or seek to buy, due let me know with whatever you have to offer. Inside you'll see a small albino Pikachu and a Shiny Pawniard. Tip, the Pikachu, will grab the items you wish when you ask for them, but please be kind to him, he's a bit on the timid side. Edge, the Pawniard, is our Security so please behave while inside. She will not tolerate those who don't follow our rules or be mean to Tip." She explains as she leads you into the tent. You see that inside the tent are 4 Booths, all decorated with different items placed neatly on the booth's table or the shelves just behind them. You notice the other Pikachu tending to a booth in the corner, while the Pawniard sits calmly in her corner, drinking some Berry Juice. "I do hope you like our small Tent and hope you find what you're looking for, user," Yami chirps, heading back outside to her chair. "Have fun." This shop doesn't update every 48 hours but mainly updates when something drastic is changed or when something is added. The image itself says "BUMP" but its far from it. 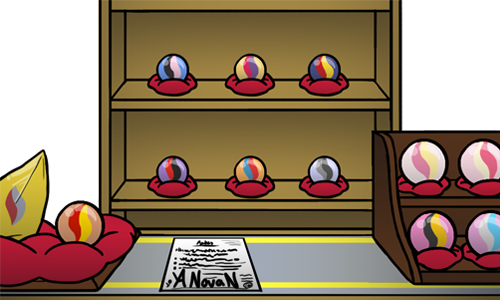 Novie's Starter Pokemon, Sai, Brings in items for restock for the Tent. Under his Image will all the info listed. 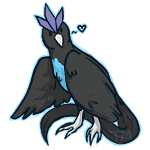 Also, to tell its a update post, Sai's bump will also have the Thread's Template be used. 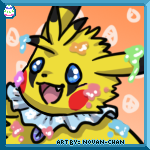 Shop finally have a Banner~ Featuring Novie's shop host Pikachu, Yami! 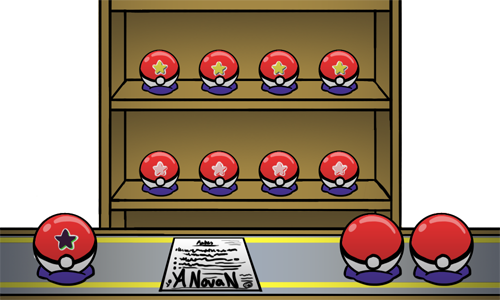 can tell which Pokeball holds what by the stickers! the 2 on the side without stickers are either slightly rare PKmn (Ex: Left Handed Delphox) or an Exclusive! 500 ea. 3 ea. 1 ea. 1200 ea. 6 ea. 2 ea. Vulpix 17 Note: Fire stones not included. Vulpix (Alolan) 14 Note: Ice stones not included. Left Handed Delphox 0 Ongoing! so many gems! I totally don't have teh CHaos Emeralds in there XD n Lookie! A cute lil display for you lil PKMN to get gummies! You step infront of a booth inside the tent, decorated with small gems everywhere on it, different sized gems taking space on the shelves. they shine nicely in dim light. There seems to be another note, assumingly with rules to the small shop. Electric is UFT. 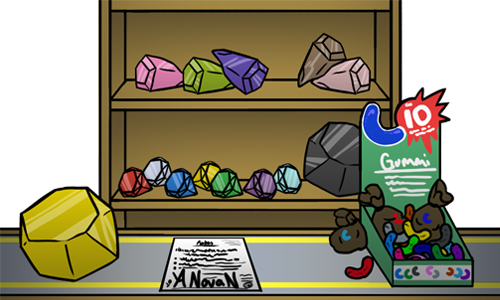 Novie is not looking for Electric Gems. You step infront of a booth inside the tent, decorated various items, big and small. Seems the shelves, table and even the wall for this booth has items! One side takes Forme-Change items and the other, Summon items. There seems to be another note, assumingly with rules to the small shop. 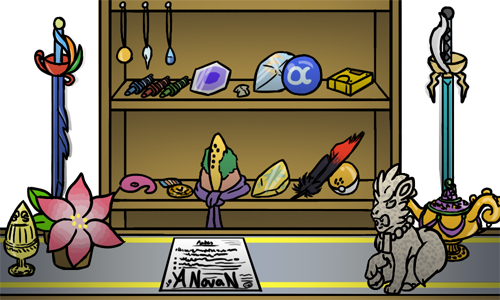 • most items are 1:1 trade, But there are a handle full of summons that are 2:1 (2 summons for that one popular summon) • Novie is forever Collecting all Electric Type Legendary Pokemon! • Tidal Bells have been crossed out! Collecting them for AlyssaNights. She buys them for the same GP price. Tidal Bell is reserved for AlyssaNights, but not strictly seeking them. You step infront of a booth inside the tent, decorated vibrant colored spheres. The Mega Stones lay neatly on lil beanbags an polished to shine. There seems to be another note, assumingly with rules to the small shop. • The Mega STones do NOT have the Inventory code on them. Thus is a manually updated by Novie when able • all Megastones are labled by their • Novie LOVES Boxes and is trying to collect them! Novie is collecting boxes! Novie has been wanting to collect Boxes for a long while but has been having a bit of a hard time. If you're interested, here's prices Novie has provided prices based around the prices seen around the rest of the shop. Depends on the shiny in the 1st thread! Do you think you might take my Inari's Lamp for your Ice feather? 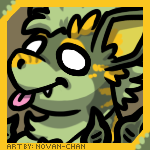 "Geckolithe" species made by me, avatar art by Novan-Chan. Melan Hydrark art made by Me, Hydrark (c) PFQ. @Bananalizard Yass, Yass~! May you please set up the trade, please? Novie~ I have 2 Med electric gems for you~~~ 30zc for the two?? (if my eyes are messing with me and I read it correctly ^^;;;) Also, a Sceptilite for your Ice Feather?? Oh, that's okay xD. I would take 100GP for the gems, if that seems fair to you xD. Alright <3 I will in a moment! Thanks, Novie! Um.Excuse my rudeness but I'd accept it, thou if its 2 Medium Gems, I buy M.Electric gems for 25GP each. it would be 50GP for both An alrighty.